The hotel is contemporary and this feel carries on to the guest rooms, with wooden floor and bold décor. The hotel has a covered swimming pool, with sauna and Jacuzzi, surrounded by a sun terrace and plenty of places to sit and enjoy the sun. We stayed for one week at this hotel on a half board basis. I am astonished that anyone could say this is a good hotel. It certainly is not of a four star standard more like a very poor 2 star. We found the staff to be rude and even aggressive. The first room we were given had loose cracked tiles everywhere, a large black damp patch on the bathroom ceiling and a cockroach to boot. Some of the plaster came down and landed in my face whilst I was taking a bath, causing me to have a asthma attack. We had to wait 24 hours before we could moved. The food was disgusting and I am not a fussy eater at all. There was a great deal of fish every night which we dont like. The waiters ignored us but made a fuss of the spanish. We lived on take away food which was expensive. The entertainment was all aimed for the spanish. The pool was covered up even though it was not supposed to be in September making it very cold. The jacuzzi was a joke. It was situated high up on a platform and drained of all the water. This was my first holiday in ten years, my first with my partner, and it was terrible. A huge disappointment. Shocked at some of the comments on this hotel as we loved it, and we are very fussy and well travelled. Although we had to move rooms after a couple of days due to refurbishment work, this proved to be no problem.The rooms are comfortable and spotlessly clean, with the linen changed often.I have rarely stayed in a hotel room that provides so much space for clothes, loads of drawer and hanging space. The food was good but not excellent, there was a reasonable choice, and some treats laid on like a chocolate fountain. Overall I could'nt really fault the food, and I am as stated previously very fussy. The best thing about this hotel and I can't praise it enough is the hotel staff. from the waiters to the cleaners, reception. Everyone was fantastically friendly and helpful which is very unusual in a Spanish hotel. We were always greeted with a smile, and absolutely nothing was too much trouble, they were wonderful, all of them. The location was the best in Benidorm, central for everything, we loved it and would never stay anywhere else but this hotel for that reason. There is renovation work going on, but the hotel needs it, so it's worth putting up with.The outside areas are a bit cramped and lose the sun mid afternoon, but there are roof patio's to enjoy the sun, and the covered heated pool was great. The public area's are bright and clean, though the reception toilet is not well placed, as you have to go through a sort of emergency exit to get to it. Otherwise brilliant hotel, loved it. We were accomodated in the 'old' part of the hotel. The rooms were shabby, balconies and barthrooms not cleaned often and the hotel was generally of a 2 star quality. The pool area is particularly drab and, due to other large buildings around it, gets little sunshine. Checkout the stairwell carpets which are threadbare and dirty. The food is not diabolical but the choice and variation is poor and on one occasion we felt that the chicken was definately not cooked properly! They do not cater much for children in the restaurant. Entertainment, even in summer, is geared around the older clientelle but the kid's daytime animation rep does his best with the facilities he has. 1) Ask for extra cards for your room to keep the air conditioning on and you will each need a card to operate the slow, small lifts. 2) Dont get ripped off by the 'parrot show man' taking photos, say no ! Finally, the so called 'gym' is barely functional and some of the appatatus are downright dangerous. Arrived in the early hours had previously asked for a high floor but got allocated the 4th in the old part of the bulding. Very basic room air conditioning bit dated but works well, food ok, pool was covered although it does say uncovered during April to Oct, sun leaves the pool area at 4pm but try to get onto the solarium, and later on the 17th floor solarium. 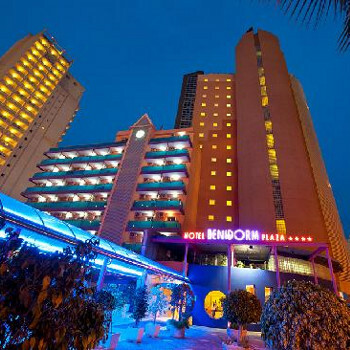 Due to late flight home wasnt given a dinner on the las night so be aware, the hotel is a 4 star I would rate it a 3 compared with other 4 star in Bendiorm, good location. The hotel is a mix of old and new build and the old part should not be graded as a four star, more accurate a three star. Even then, I've stayed at much better three star hotels. On arrival we were allocated two rooms, booked three months beforehand. One was a single berth on the eighth floor (808) the other was a three berth on the ground floor (008). Despite strong protests to the manager about a family being split by eight floors, I was told' a change wasn't possible until two days time at the earliest' because they didn't have two rooms together, but vacancies were advertised by a big neon sign. Reluctantly we accepted the situation, after all we were beginning our holiday. Directly above the stage in the lounge bar. Next to a Jacuzzi that was in continual use. The heat from it conducted through the thin concrete wall making the room like a sauna. The air-con couldn't keep pace with the heat generated by the Jacuzzi, rendering it useless. Next to a public toilet. Close to a keep-fit/weights room (gymnasium) that is used from 8.00am onwards. The gym is situated across the corridor adjacent to the public toilet. The bathroom window (approx 30cm X 25cm)in room 008 opens to the public toilet that is used by anyone with need, and visual access could easily be gained by standing on the toilet seat and watching the activity in the shower, should a person so desire. There is a new hotel being built directly across the road so the dust and noise made the patio out of bounds. We arrived at noon on the 19/6 and moved up to room 807 on the 21/6 in the afternoon, so stress started to ease and the holiday started to improve. The clientele is predominantly elderly Spanish consequently the entertainment was tailored to their choice, and that was ballroom dancing. On the positive side the food was good, especially if you like fish. The hotel has a gala night with a decent selection and it also has a Paella night which I enjoyed. On the negative, dinner starts at 8.00pm 'til 10.00pm, which is a little late for UK children, consequently, early evening trips to McDonalds were regular. The hotel staff's attitude wasn't any different to any other Spanish hotel I've stayed at. The dining room and cleaning staff were pleasant but the management and reception could do with lessons in customer relations. The hotel is located just far enough from the hustle and bustle of the new town so a peaceful night's sleep is assured. Hotel in a good location, very near old town (poniente side). Large choice of food, always warm & tasty. Full board ideal as you can have choice through the day, when it suits you. Hotel very clean both inside & out. Staff very friendly & helpful. On arrival, our room was to left of reception, the older part of hotel, and overlooked the swimming pool & bar area with nightly entertainment. Found it to be too noisy in the evening, so asked for a change of room. We moved the following morning to a more modern and brighter room, away from the noisier side (to R.H.side of reception area). Staff could not have been more helpful. Would say this would appeal more to the 50+ age group. Entertaiment comprised mainly of a Duo, one singing, other on an organ,-music geared more to those who like ballroom/oldtime dancing. All in all, very good value, would definitely visit again. My wife and I stayed in the Plaza which we found to be very out dated inside,the rooms in particular are in need of a facelift all of the carpets were being cleaned at the time of our stay, which was a bit of an inconvenience. The location is ideal with access to the new and old town and only minutes from the beach.The food on the whole was good with plenty of choice,however the menus were a bit repetative. The hotel staff were generally friendly but a little over enthusiastic clearing away tables before you had finished eating which became a annoying in the end. The entertainment was not up to much, a man who could spin plates, a knife thrower and a juggler who could not juggle, the resident band was Del Boy singing in Spanish,not the best. On the whole location was the best feature but would still not use this hotel again as there are better ones. Hotel was in a very good location, very close to the beach. The hotel was very clean and the staff were very friendly. We did not see much of the entertainment but enjoyed what we did see. On entering the dining area wet wipes were provided which I thought was a very good idea,clean hands and all that, but noticed not everyone took one. The food very good, something different every single day which makes a nice change. Morgan loved the king prawns and wished they were on every night, she is a picky eater but even she managed to have a couple of choices to choose from being only 5 years old. This is the 5th time we have been to this hotel as we haven't been disappointed in previous years. There was plenty of choice in the food. The location is excellent; in between the old and new town, plenty of bars around the hotel area. We realised that the entertainment had gone downhill from previous years but did it get better in the second week.